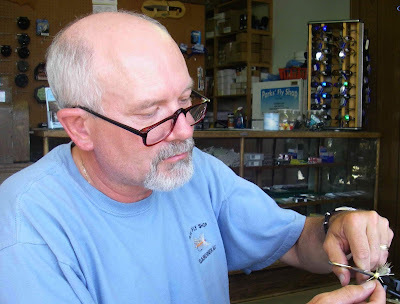 I've been gone over a month; vacationing, guiding and tying flies for Parks Fly Shop in Gardiner, Montana. I guided and fished in Yellowstone National Park. My son Russ drove out with me and stayed the first week and we had a ball and caught LOTS OF FISH! Russ with his first fish on the Yellowstone River... but not his last! Brookies... how many did we catch? Too many? Can you ever catch too many? My best fish of the trip a Brown Trout of 20 1/4 inches from a Yellowstone River float with my fellow PFS guide, Ben Jewell. This big boy took an Olive and Cream Double Bunny streamer. Nice trip! I would like one day to fish in Montana.